Today went on a day-trip to the Pas-de-Calais, near Cap Gris-Nez. First to visit the secret V3 base at Mimoyecques, but the management there must have thought the weather was better for swimming than walking through damp and dark underground tunnels, so the place stayed shut. 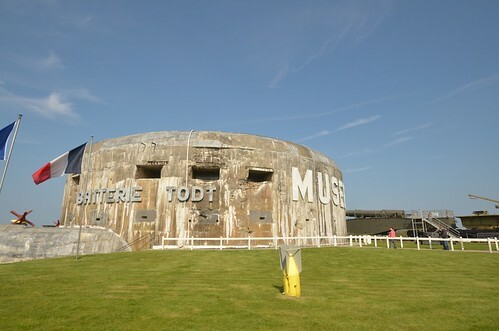 Off we went to the Batterie Todt museum at nearby Audinghen, just in time before the 2-hour lunch break, so we couldn’t get in there either. Not easily deterred, we drove to the charming town of Wissant to have lunch on a sunny terrace, and then back to Audinghen. Here you can see the photos of our day. Too bad about the V3 base (maybe it was a hoax? ), but the other museum was really interesting.